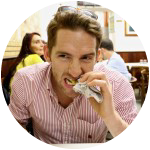 The Trastevere “Locals” Food Tour is the mother of all food tours and definitely a tour not to be missed. Anyone who is a foodie will certainly appreciate the various tastings of genuine Roman cuisine. 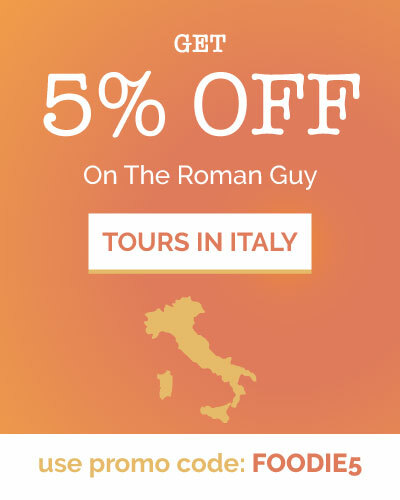 There’s six different locations (primarily in the Trastevere district of Rome) offered on this tour. What sets this tour apart from the others and makes it so great? Well, take a look! 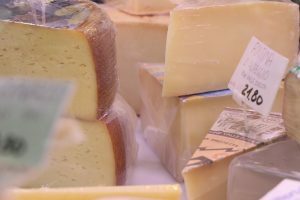 This cheese lovers paradise located on a little side street off of Campo de’ Fiori, packs a one-two punch, offering tastings of at least 7 different cheeses such as formaggio Lagrein, buffalo mozzarella, smoked mozzarella, pecorino romano, provolone, parmigiano reggiano, and burrata. Plenty of white wine is also provided to perfectly compliment the varied cheese selection. 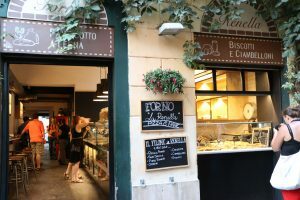 Depending on the day of the week (because some of the places visited are family run businesses), you will either visit this cheese shop (on weekdays) or if you take the tour on Saturday, you’ll visit the salumeria mentioned below. This meat shop, located in the Campo de’ Fiori square, sells any type of deli meat you could possibly imagine. 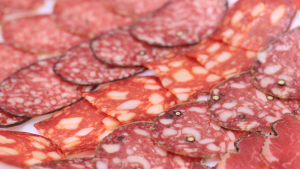 Since 1890, four generations of the same family have been carefully crafting and selling these meats, which include more than 100 different kinds of salami. Here you’ll sample cold cuts such as capocollo and salami made various ways including with Barolo wine, nuts, and truffles. A generous glass of wine is also provided to go with your tasting to make it just perfect. 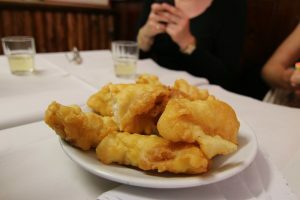 Dar Filettaro (a Roman institution), has been in business since the 50s; famous for their filetti di baccalà, or fried codfish fillets, a typical Roman street food. During the “aperitivo,” or happy hour, you can often see a line out the door of hungry Romans. At this stop, you’ll make your way to a table in the back of this little hole-in-the-wall trattoria. Here your delicious fish will be paired with a glass of local white wine. Located in the heart of Rome, La Renella is known for its ancient wood-burning oven (active since 1870) used to prepare all of its pizza with traditional methods and the freshest ingredients in order to offer its customers great pizza. One of the oldest “forni” or bakeries in Rome, here, you’ll sample a fresh-out-of-the-oven pizza margherita (the original and traditional Italian pizza flavor) “al taglio,” or by the slice. Yum! Tastevere’s function is twofold: By day it’s an organic food market and by night its a place where you can sit at one of its 3 tables and taste the delicious concoctions they prepare with these local products. Tastevere is a Km 0 place of business meaning they have a strict farm to fork policy and don’t use any products that don’t come from local farmers. At this stop on the tour, you’ll be treated to cutting boards filled with samplings of all these organic products. You’ll also have a choice of a glass of red or white wine. At this little trattoria, you’ll enjoy an “antipasto” or appetizer of carciofi alla giudia, a traditional Roman dish which literally translated means artichoke prepared Jewish style. 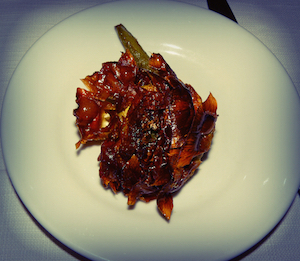 This delicious artichoke followed by a tasting of two typical Roman pasta dishes: amatriciana and cacio e pepe. A large carafe of both red and white local wines is also at your disposal to enjoy during this wonderful meal…keep filling up your glass until your heart’s content. You’ll complete the night by topping it off with some delicious gelato. You can choose up to 3 flavors at this father and son run ice cream shop, where they handcraft every single flavor. 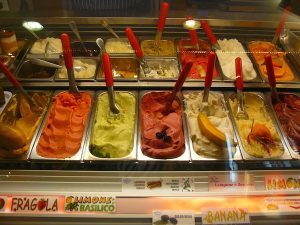 They’ve got some of the most inventive gelato in Rome, boasting flavors such as chocolate/cinnamon/chilli pepper and lemon/basil. They’ve also got traditional flavors such as pistachio, strawberry and vanilla for the ice cream flavor purists. Have we made your mouth water yet? Don’t hesitate. Go to theromanfoodie.com or click on the picture below to book your Trastevere Rome Food tour today. Tour sizes limited to ten people to ensure personalized attention for each customer and a quality foodie experience. If you enjoyed this post, please share on social media channels and include our handle for Facebook, Instagram, or Twitter – we’d love to share Rome foodie info with more people!